Buy Pepsi Brand products with Paytm offer label (see image below) and get free Rs. 15 or Rs. 20 PayTm cash. This Offer is valid in India from 15th Mar 2016 to 31st August 2016. Offer valid on purchase of beverage sold by Pepsi under the brand name ‘Pepsi’, in sizes of multi serve PET bottle (1L, 1.2L, 1.5L,1.75L,2L, 2.25L), and single serve PET bottle (400ml, 500ml, 600, 750 ml), on which the Campaign is applicable, bearing Pay TM logo. How to get PayTm cash with Pepsi products? After purchasing the Product, look for the 12 digit code (“Code”) printed on the back of the label. What is use of Paytm Cash? 1. Enter your cash code from Pepsi pack and Click Proceed. You can use upto 1 cash code in total till end of offer. Participation in this Promotion namely, Paytm Pepsi Offer (“Offer”) is purely voluntary and optional. This Offer is not valid in conjunction with any other Offer. Products also available without this Offer. By participating in this Offer, each participant is deemed to have accepted these terms and conditions. 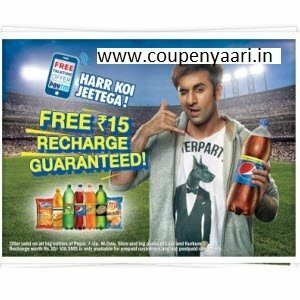 This Offer is being conducted by PepsiCo India Holdings Private Limited (“PEPSI”) in association with One97 Communications Ltd.’s (“One97 or Paytm”) (collectively referred to as Organizer) on One97’s platform, namely www.Paytm.com (‘website’), for Products defined hereinafter. This Offer is valid in India from 15th Mar 2016 to 31st August 2016 (‘Offer Period’) on purchase of beverage sold by Pepsi under the brand name ‘Pepsi’, in sizes of multi serve PET bottle (1L, 1.2L, 1.5L,1.75L,2L, 2.25L), and single serve PET bottle (400ml, 500ml, 600, 750 ml), on which the Campaign is applicable, bearing Pay TM logo hereinafter referred to as “Product”. After purchasing the Product, look for the 12 digits code (“Code”) printed on the inner laminate label of the Product. After getting this Code, the participant can participate in the Offer in the following manner and avail Paytm Cash. Paytm cash is the term used to define Paytm cash that participant gets when he applies the code on Paytm website . The cash earned this way is stored in the Paytm wallet and is used to purchase products/do recharges on Paytm website only. No cash would be given in lieu of Paytm cash. Log on to www.paytm.com/pepsi.Enter the Code printed on the inner laminate pack (12-Digit Code). Register/ Sign in to your Paytm to add Paytm Cash as per following table to your Paytm wallet within 24 hours. This Offer is not valid in conjunction with any other Offer. Products also available without this Offer. Participation is optional. By participating in this Offer, each participant is deemed to have accepted all the terms and conditions. Actual recharge will vary as per the top-up plan of the respective operator and is subject to applicable taxes and levies. Post paid users may pay any post paid bill on Paytm, only if they are paying their entire outstanding bill amount. Paytm/PEPSI does not take any responsibility for partial bill payment being rejected by Post paid users’ operator/service provider. If Post paid users’ bill amount is higher than Paytm cash he/she has in his/hers account, he/she will need to pay for the balance amount through any of the payment modes/means accepted on Paytm. Paytm cashback offered as part of this offer is non-transferrable, non-refundable; and no physical cash payment will be made in lieu of this. At any stage, PEPSI and/or Paytm reserves their right to call upon the Participant to submit any document for verification of identity as per its sole discretion. Neither PEPSI nor Paytm.com will be liable for any delay in actual redemption under this Offer reflecting in the customers’ account. Paytm and PEPSI will not be responsible for any loss or damage to the Code. At any time Paytm and/or PEPSI reserves the right to update and/or amend all or any of these terms without further notice. PEPSI and/or Paytm reserves the right to cancel, change or substitute Offer at any time without any prior notice. PEPSI and/or Paytm may require participants to participate in promotional activities (such as publicity and photography), free of charge, and he/she consents to the usage of his/her name, photograph, film recording, portrait, picture, voice, likeness and biographical information for media coverage, news or information and for advertising or promotional purposes in any media for an unlimited period without remuneration. The foregoing license shall survive any termination or expiration of this Offer. All customer related queries for this Offer can be addressed to paytm.com/care or + 91- 120-3062244. In case the customer finds a promotion pack without code and files a complaint for the same or approaches the company with this complaint. In that case the Organizers liability would be limited to providing the complainant with a new promo pack to enable him to participate in the promotion as per T&C. The complainant cannot demand any monetary or other compensation for the same. PEPSI and/or Paytm shall not be responsible for any loss, injury or any other liability arising out of the Promotion or due to participation by any person in the Offer. PEPSI and/or Paytm shall not be liable for any loss or damage due to Act of God, Governmental actions, other force majeure circumstances and shall not be liable to pay any amount as compensation or otherwise for any such loss. PEPSI and/or Paytm shall not be responsible for downtime on the services, caused due to technicalities (like failure of hardware equipment, configuration issue, network congestion), or due to decisions/changes in regulations that are carried out by TRAI, RBI, DoT or any other regulatory body. any warranty of merchantability, availability, and fitness for a particular purpose or non-infringement. The terms and condition of this Offer shall be governed by Indian Laws. Any and all disputes, controversies and conflicts (“Disputes”) arising out of the Contest shall be referred for Arbitration to a Sole Arbitrator to be appointed by PEPSI and Paytm whose decision shall be final and binding on all. The place of arbitration shall be Delhi. The Courts at Delhi shall have the exclusive jurisdiction in respect of all the subject matter with relation to the Offer. No, your cashback is never lost. Since you have already reached the monthly limit on the basic wallet, your cashback cannot be added in the current month cycle. Your cashback will be processed in the next month cycle. Otherwise, to get this cashback in the current month cycle, you need to get your wallet upgraded to a Prime Wallet.